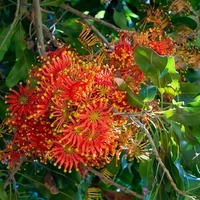 Wheel of Fire is an evergreen flowering and timber tree originating from the east coast of Australia, where it occurs in subtropical rainforests. 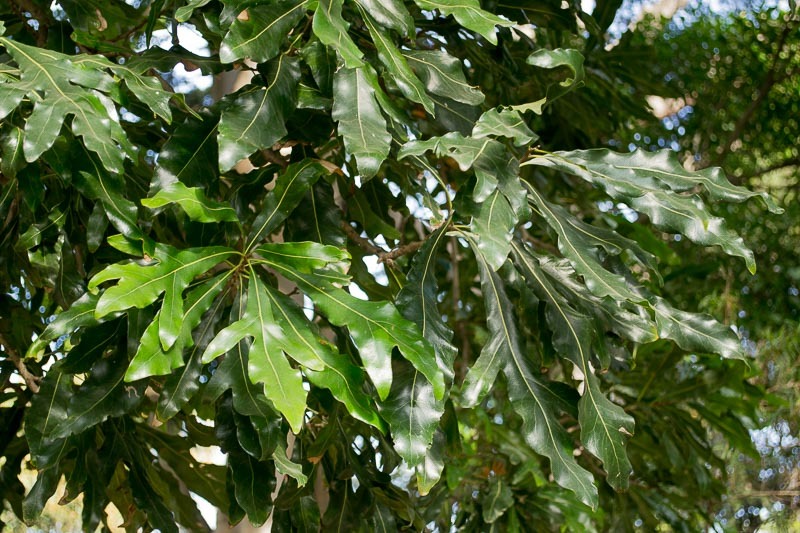 It grows slowly to up to 30 m (98 ft) tall in its natural habitat, though is more commonly 10 to 15 m (30 to 50 ft) and forms a straight, slender trunk of 75 cm (2.5 ft) diameter supporting a densely leafy columnar crown. The bark is dark grey to brown, sometimes wrinkled and with shallow fissures on older trees. 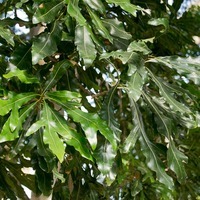 Leaves dark glossy green, up to 25 cm (10 in) long and deeply lobed on young trees, changing on mature trees to smaller elongated oval leaves with wavy margins. Flowers large and bright red with an eye-catching spoke-wheel shape. They bloom from summer to autumn, in clusters borne directly on the trunk or mature branchwood, but are partly hidden by the dense foliage. Green, boat-shaped seed capsules follow, becoming black-brown when mature and then split open lengthwise to release their seed, which are winged for wind dispersal. 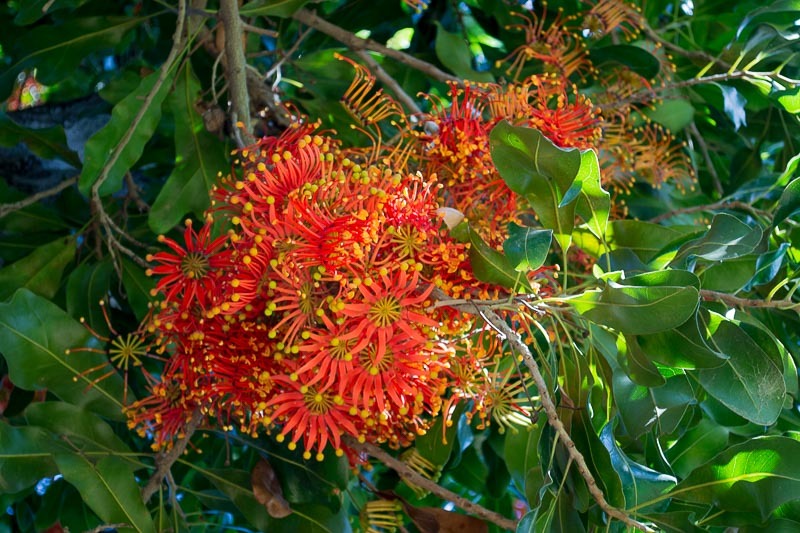 Wheel of Fire is cultivated in gardens, parks and urban landscapes for its shapely, compact form, lush green foliage and showy flowers, which produce abundant nectar, helping to sustain nectar feeding birds such as hummingbirds. The flowers and juvenile foliage are sometimes cut for use in floral arrangements. The wood is medium-weight, averaging out at around 750 kgs per cubic meter (47 lbs per cubic ft) and has attractive reddish-brown heartwood. Large logs, when available are sawn into lumber for making furniture and cabinets, or are sliced for decorative veneer. Its natural durability against rot, decay and wood boring insects is not well researched. Grows naturally in moderately humid subtropical and tropical mid- to high-elevation climates, generally in areas with annual lows of 10 to 20 °C, annual highs of 19 to 30 °C, annual rainfall of 700 to 2600 mm and a dry season of 6 months or less. New plants are usually raised from seed or cuttings taken from semi-mature wood. Performs best on free-draining clay, loam and sand soils of an acid to neutral nature, generally with pH of 5.0 to 7.0 and on sites with full to partial sun exposure. It has poor tolerance to alkaline or limestone soils and soils high in phosphates. There does not appear to be any record of its escape and naturalisation anywhere, despite its widespread introduction and cultivation outside of its native range. It is assessed as a low weed risk species for Hawaii by the Hawaii Pacific Weed Risk Assessment project (HPWRA).